This is the inside of the “Monet’s garden” brochure. 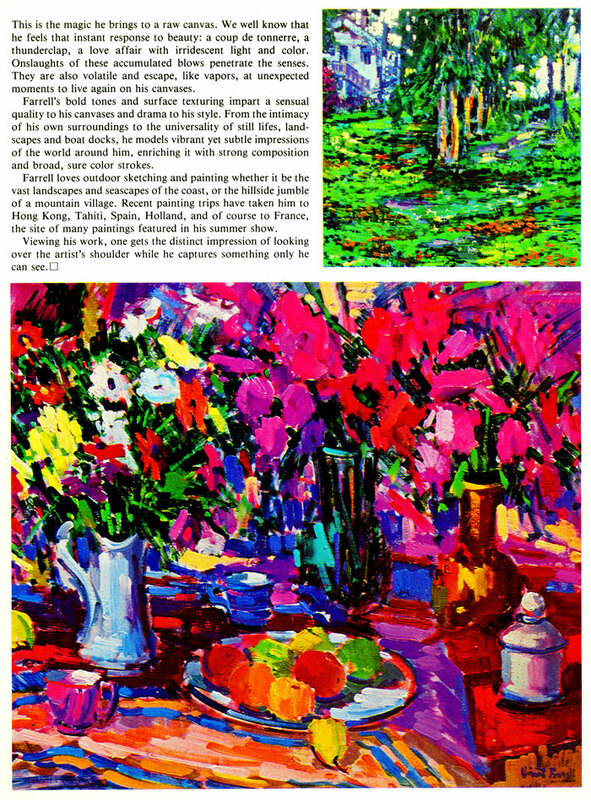 The cover of the brochure is posted below with a vibrantly colored painting of Claude Monet’s garden in Giverny, France and the invitation for the announcement of the mid-August summer show from 1980. The painting, depicting a city-scape of Paris, an interpretation by Vincent Farrell (1928-2008) my beloved father, of Le Pont Alexander III, considered to be the most beautiful bridge in all of Paris. This bridge, takes its name from Tsar Alexander III upon conclusion of the Franco-Russian alliance in 1892. The foundation stone was laid in 1896 by the son of the Tsar , Nicholas II , and construction of the bridge was completed in 1900.There are 32 bridges spanning the river Seine in the city of Paris alone, however, Le Ponte Alexander III, by far is the most ornate and detailed historical monument in Paris of its kind. The bridges’ architecture is taken directly from the Art Nouveau period and complements the Grand Palais, which the bridges connects to on the right bank of the Seine river. As part of the structural design of this bridge, there was no loss for incorporating art and engineering design in the overall bridge concept with the use of many different artists to produce the allegorical sculptures and decorative motifs of the Franco-Russian alliance. The four ornate guilt statues of cherubs or ‘Fames’ riding winged guilt pegasus, are resting upon the four socles or towers which stabilize the counter weight of the bridge’s arch. Art and science come together in this land mark as was intentional by the bridges creators. The gleaming appearance of the golden Fame statues are actually made of bronze. “Fame of the Sciences” (Rennommée des Sciences) and “Fames of the Arts” (Rennommée des Arts) are leading to the right bank and are visible in the painting, with “Fame of Commerce” (Rennommée du Commerce) and “Fame of Industry” ( Rennommée de L’industrie) leading to the left bank. The design of the bridge by its architects, Joseph Cassien-Bernard and Gaston Cousin, takes into account as to not disturb the views of the Champs Elysse or the Invalides, as they were under strict orders to preserve the over all panorama of the Grand Palais, the Champs Elysse and the Invalides. Today, this bridge remains the visual signature of the Paris horizon and is the most recognizable and cherished historical landmark in Paris. As a painter, my father thrived in Paris, creating many drawings and studies , sometimes from the view of his own hotel room or as he sat in a Paris bistro, people watching, with pen or pencil and paper, even a napkin would serve as his canvas. “From eye, to hand, to paper”, he would say. Wasting not one moment, he created some of the best paintings of his career taken from his travels through out Europe, this painting of “Le Pont Alexander III” is one of those masterpieces. 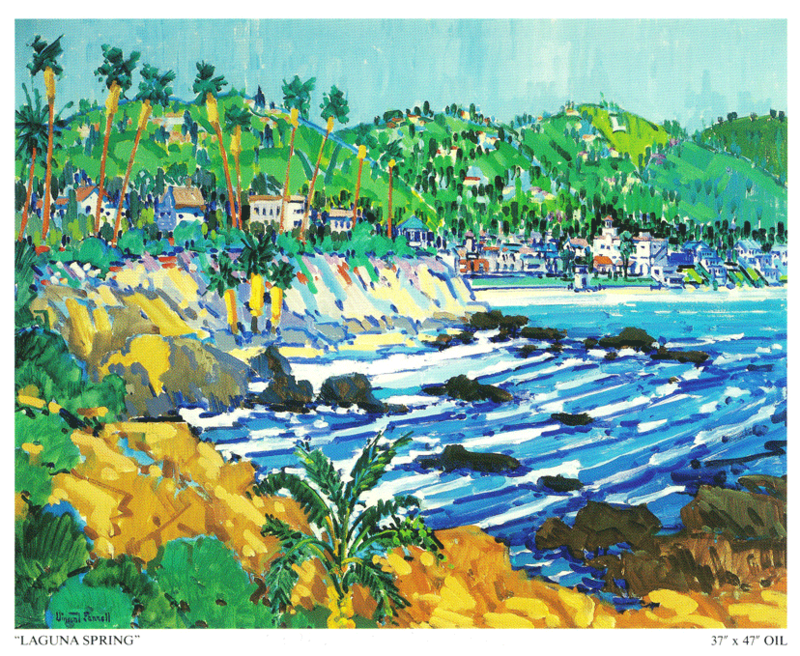 When my father returned to Laguna Beach he began painting for a show which he would exhibit in his own studio gallery at 1330 So.Coast Hwy. The painting of “Le Pont Alexander the III”, with the Eiffel tower against the luminescent grey and rose pink skyline, exhibits the opulence of Paris architecture in her abundant beauty. In the painting’s foreground we see working boats, docked on the left bank, in drastic contrast to the elegant and regal architecture of the bridge itself . The river Seine separating the two inherently different worlds, and the bridge as the gateway connecting the life of the privileged and powerful on the right bank to that of the working class on the left bank. The painting’s perspective for the viewer originates on the left bank with the docked working boats in the foreground, As if we look from a far upon an overwhelmingly extravagant, lavish world of government, power and artistic ambition as detailed in the Paris skyline. The exclusion or the sincere desire to actually be excluded only to view, from a safe distance with great appreciation for the object of extravagant beauty of such a world, would be a common thread repeatedly depicted throughout the course of my father’s art work. There is no doubt my father was awe struck by the exquisite beauty of the city of Paris as he poured all of his admiration and emotions into this painting. 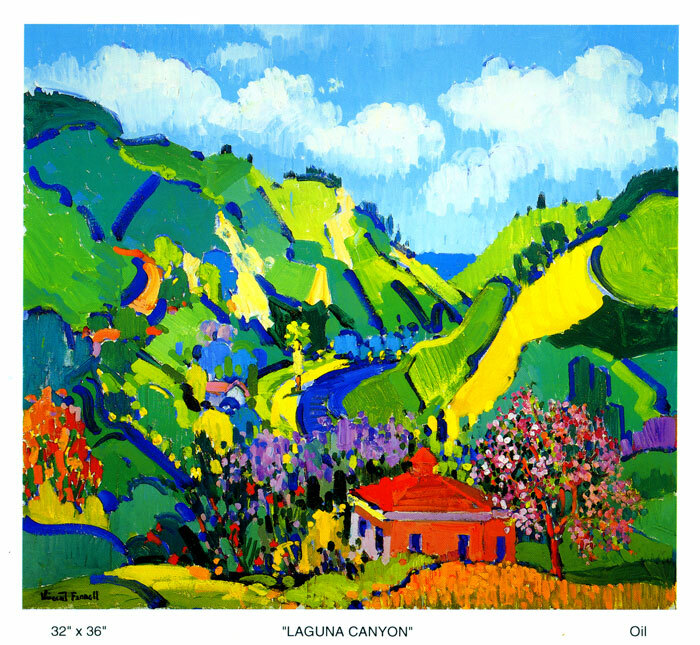 One morning after my father had finished the actual canvas and as it was still drying on the easel, a man walked into his studio gallery and immediately fell in love with the subject matter , demanding to purchased the painting on the spot. My father tried to convince the man, to allow him to paint a copy, as he explained to his potential client, this painting was for his upcoming show, yet, the man insisted, he must purchase the original. That man was Jack Kent Cook (1912-1997) the then owner of the Washington RedSkins football team. 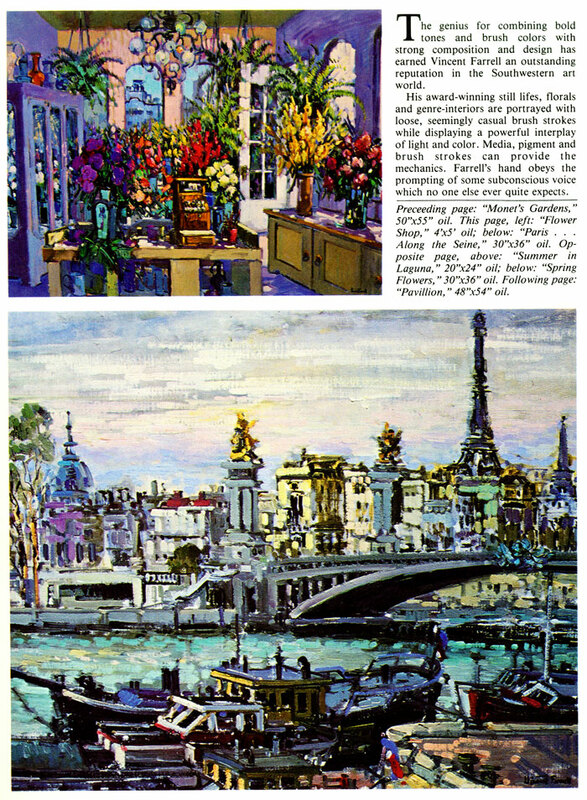 My father was extremely flattered and humbled by Mr. Cook’s purchase of his painting “Le Pont Alexander III” and since the painting had already been photographed for the up coming brochure for the 1980 August exhibition prior to its sale, this is the only reason it appears in this brochure. 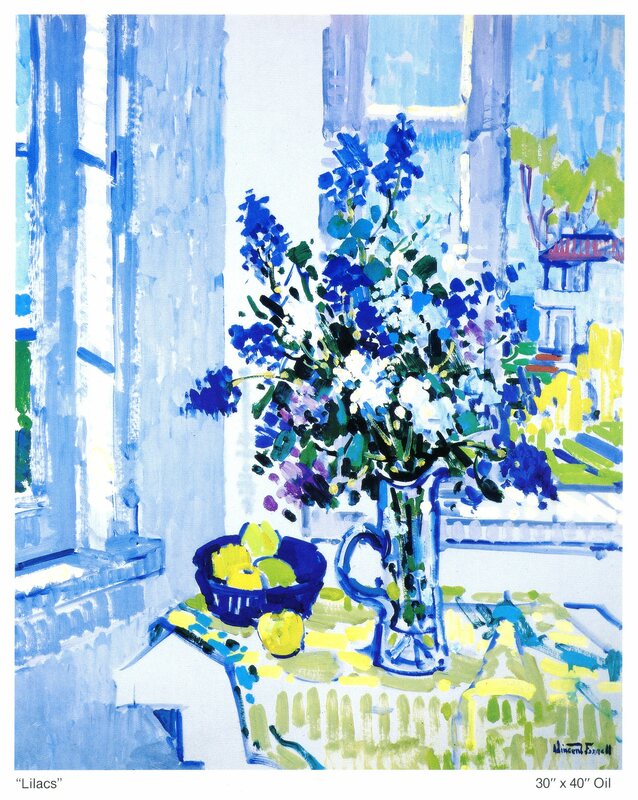 Every painting created from his trip to France in the spring of 1980 sold before the show opened to the public. In 1982 When the Washington Redskins won the super bowel , I happened to be working in the gallery the following morning with my father, when he called Mr. Cook to congratulate him on his team’s win. 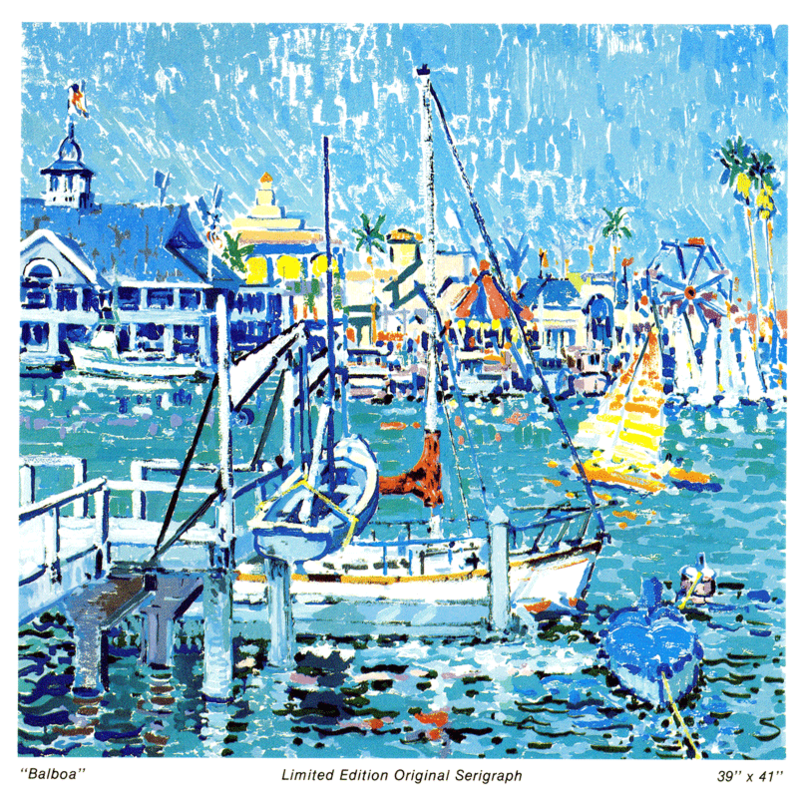 My father started the conversation , “Perhaps you do not remember me but I am the artist who created the painting “Le Pont Alexander III” which you purchased here in my gallery in Laguna Beach.” As I stood next to my father, I heard the roar of laughter from Mr. Cook over the receiver of the phone and later my father repeated the conversation to me. Mr. Cook exclaimed,”How could I forget you, Vincent! I look at your beautiful painting every morning when I wake up and every night before I go to bed, because i have it in my bedroom, I love it!”.